While in Germany I did not see one of these, but had a conversation about them. 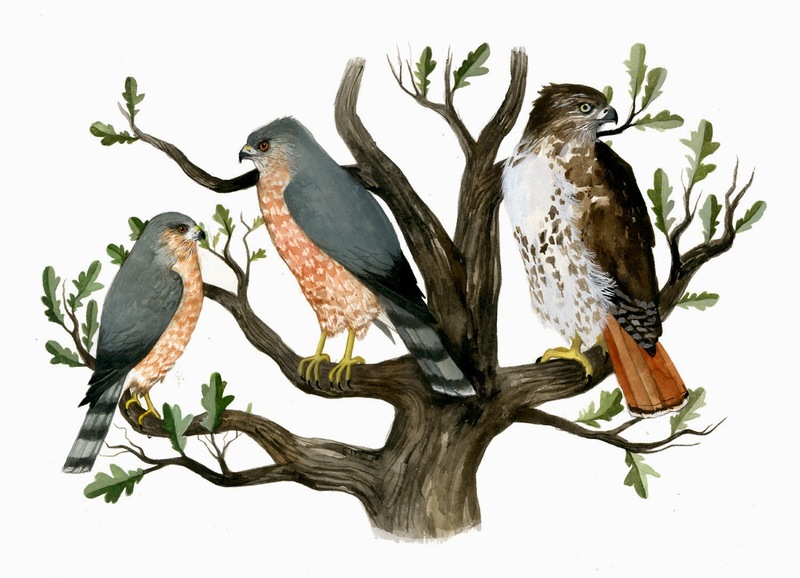 Another artist at the poster show event I attended in Hamburg, Nick Rhodes (you can view Nick's work HERE), turned out to have some affection for my favorite family of birds, corvids. Nick is from Great Britain, and we began talking about corvid species native to the UK. We went over rooks, and ravens, and then he described a species that is not common, but can be found around high sea cliffs near Wales. His description matched the Red-billed Chough specimen I had been admiring at the Field Museum some time ago. The two species of choughs, Alpine and Red-billed, are closely related to crows and jackdaws. The Red-billed can be found in coastal cliffs of Great Britain, Ireland, and Brittany, as well and parts of southern Europe and Central Asia. There have been recent population declines in Red-billed due to habitat fragmentation and degradation. 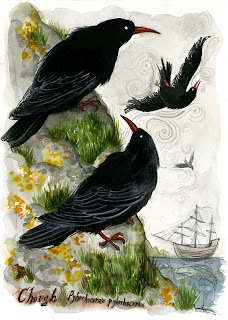 I loved the image I got when we talked about them: elegant, glossy black birds living on high cliffs, being tossed about by the wind over the sea. Neat to learn about these Diana - I've never heard of them before - 'd love to see them in the wild. I also like how you painted them with the swirls in the air and blank eyes. Do you know if they have the intelligence of other corvids? And how do you pronounce that? "Choff" or "chuff" or something? I asked my local Field Museum ornithologist how "Chough" is pronounced. He raised an eyebrow and said that he didn't know for sure, but that he says "chuff". I know very little about them, but would assume that they possess the clever disposition typical of other corvid species. Ever read any of Bernd Heinrich's books on his raven studies? Good stuff. We have White-winged Choughs here in Australia, and we pronounce it "chuff". They're in a different family but I imagine the pronunciation is the same.